The Fed pumped market participants full of $600 Billion of fresh QE2 testosterone that sent stocks into a euphoric rally to a new bull market closing high of Dow 11,444, which apparently has major medical consequences for the mainstream press and BlogosFear due to the general outbreak of amnesia as to the commentary that had transpired during the preceding 6 months of deflation, depression, double dips and the bear market rally's always imminent end. The below graphs from earlier articles illustrate how general amnesia now reigns as the bear market rally mantra who's end has always been imminent for some 20 months has now been conveniently forgotten (until the next sell off comes along...) because apparently everyone has now always been a Bull! Well that was not what one would have read from the likes of the Financial Times and Wall Street Journal downwards, all the way into the BlogosFear that has a general tendency 90% of the time to regurgitate what is written in the mainstream press , which means over 90% of that which is written about the stock market is either by salesmen (they would no longer be able to sell if the public knew the truth that a coin toss has far greater accuracy), journalists (who fancy themselves as economists but in reality are mostly propagandists for their proprietors) and academics economists (who live in fantasy land theoretical models that never match reality). The whole of the summer correction saw warnings that the H&S pattern implied that the stocks bear market resumption was always imminent, the graph illustrates how the right shoulder mutated hunch bank of notre dame style all the way into October, and has continued to do so all the way into a new bull market peak. The whole of August witnessed a crescendo of imminent stock market crash commentary right across the media including Barons, Bloomberg and the Financial Times on the basis of the 'Hindenberg Omen' signal, which reached its greatest intensity just as the stock market bottomed during late August 2010 (22 Aug 2010 - The Hindenburg Stock Market Omen Doomed to Crash and Burn? ). On July 7th the Dow was at about 9,800 - Virtually the bottom. Wow, this guy Glenn Beck is 100% propaganda! The word I am looking for is demagogue! The blood bath was for the bears, no wonder SocGen was bailed out by the French Government! I tried to warn the editor of this UK based magazine at the time that their weekly print magazine's featured article was totally wrong to call for an end to the stock market rally. Just read your piece in MW 9th July. "The rally that began in March 2009 is well and truly over"
I don't think so - The rally that began in March 2009 has barely begun. The 15% correction is following a 70% advance. RPI 5% - There IS NO DEFLATION. USSA - United Socialist States of America ? This week the masses received another reminder of the illusion of free markets in the Fed's latest money printing run of $600 billion (QE2) that is on top of the $1.75 trillion printed to date since March 2009 for the primary purpose of monetizing U.S. government debt as a consequence of an annual budget deficit that is running at about $1.5 trillion a year that is flooding the world with liquidity and acts to drive up all asset classes as fractional reserve banking induced leverage magnifies the head line figure many fold. If you want to make money in the markets you need to understand the fundamental fact that the financial markets are highly manipulated by vested interests that operate as a tripartite between the media, the bankster / CEO elite and the politicians that operate under the banner of democracy. Academic economists are funded to follow their respective Schools of thought i.e. Keynesian etc. What it all boils down to is to generate propaganda so as to allow politicians to convince the masses of particular policies in support of the Elites agenda for the continuous funneling and concentration of a nations wealth and power into their hands. During the financial crisis this was illustrated by the Cancer of Goldman Sachs and other Investment Banks that used the propaganda of the threat of financial armageddon to literally get away with stealing trillions of dollars of wealth from tax payers. Academic economists are nothing more than sales men pumping out propaganda that flows out of particular elite funded schools of thought. Deflation is one of the primary propaganda tools that is used to allow the government to implement perpetual inflationary policies that continue to erode the purchasing power of workers and savers so as to give the illusion that the workers hard work and increasing productivity is being rewarded when the exact opposite is true, families today work twice as hard as in the past for far less real terms pay, this allows the mechanism for debt slavery to take place where all ordinary citizens are increasingly enticed to take on debt that compounding interest at rates far beyond the inflation indices ensure will never be repaid and thus succeed into turning most of the population into perpetual debt slaves that spend as much as 1/3rd of their working lives servicing their debt slave masters, and another 1/3rd on servicing government taxes. Which means in reality most people only enjoy 1/3rd of their life's work. Workers are born into debt slavery and the mechanisms for enslavement are accelerating as witnessed by the British Governments new policy of putting every University Student into a minimum of £40,000 of debt slavery before they even do a single days work, before they even think about taking a step on the housing ladder. Delusional deflationists are either directly or indirectly funded by the elites that want them to push the non existant deflation propaganda whilst at the same time pumping out propaganda to condition the population into thinking that inflation is good, normal and something that they should seek to accept as for their betterment when in actual fact inflation is a stealth tax that seeks to steal their accumulated wealth by means of erosion of purchasing power of earnings and tax on notional income / gains on capital and savings, for instance in the UK savers if they lucky receive 2.5% in interest which is then taxed at 20% or 40% depending on their tax band. Whereas recognised inflation (RPI) is at 4.6% and real inflation is at 6%. So savers wealth is being stolen by the government by means of inflation AND then again the sub inflation interest payments are TAXED! The bankster's ensure that citizens are put into a life time of debt slavery by charging interest rates far beyond the official inflation rates, which perhaps gives a clue as to what the real rate of inflation actually is at, rather than that which phony government inflation statistics suggest it to be, whilst at the same time bankster's borrow at LESS than the rate of inflation courtesy of the biggest bankster of them all, each nations central bank, at rates of as little as 0.25%. The Elites have succeeded in brain washing most people into believing the delusional world where deflation is bad and always imminent whilst inflation is good and something that everyone should agree with and look forward to! The Fed dumping dollars onto the currency markets is to make dollar peggers such as China pay a heavier price for maintaining their pegs. Again the mainstream press right from the Financial Times downwards that is regurgitated across the blogosFear have missed the big picture completely with their mantra of currency wars and statements that China will dump its devaluing dollars. China will not dump its approx $2 trillion of dollar reserves, instead China will add at least another $4 trillion of dollars to its reserves during the the next 8 years. Why ? Because the big picture is the policy for China doubling its ANNUAL GDP from $6 trillion to $12 trillion over the next 8 years and therefore resulting in a gain of $24 trillion against what ? a risk of a loss of $500 billion on the current $2 trillion of holdings ? The risk reward is clearly to pay $1/2 trillion for a greater probability of achieving a $24 trillion gain! That IS the big picture and why the pseudo economists / journalists in the Mainstream press are wrong and probably will never realise that they are wrong whilst all the time China keeps doubling its GDP all the way to overtaking the US Economy in terms of total GDP whilst at the same time wielding a bigger political stick given the political weight of its expanding dollar reserves, much as Saudi Arabia has been able to do as evidenced by everyone but those actually responsible for September 11th being blamed for the terrorist attack. China's Economic Boom has Barely Begun! Those that talk of China collapse do not understand the big picture at all, that despite all of the growth to date, this is NOTHING as compared to what is going to follow as the below graph illustrates that China is on a trajectory towards near equalling GDP per capita with the West, which effectively means that if western economies continue to chug along at perhaps between 2% and 3% per year, then China's economy could grow SEVEN FOLD in total nominal GDP terms over the next 20 years! I.e. to twice the size of where the US economy will be at that time. So whilst the mainstream press and BlogosFear may talk about an imminent end to China's boom, I will continue to hold onto China Investments and during future market panics seek to accumulate more exposure to the China MEGA TREND Growth Story! Investors need to learn to identify and stay focused on the mega-trends and not become confused by mainstream press and BlogosFear noise. How else are the governments going to power future energy demand whilst at the same time cutting carbon emissions, if not by building literally hundreds of new nuclear power stations over the next 20 years. This boom has not even begun, I can imagine 20 years from now when the boom is in full swing as the flood of investment money has generated much technological advancement, every city and small town will be planning to have its very OWN mini nuclear power plant given the economics involved at that time for cheap clean energy. It's akin to buying Gold in 2001, not long after fool Brown sold half of Britains Gold reserves near the 20 year Gold bear market bottom. However nuclear investors are lucky as the boom and bust of 2007 in uranium prices should have put nuclear power back onto the radar screens of long-term investors. For commodity investors the focus is on riding the uranium bull and bear markets as investor sentiment sends the price into cyclical boom and busts within an overall secular uranium bull market. The current price of $56 is set against a low of $40 earlier this year and a 2007 peak of $138, which as the chart above illustrates shows a market that is in the early stages of its next multi-year bull market that will likely see Uranium peak at a price north of $138 some years from now. For stock investors there is the big Uranium miner Cameco and the smaller Paladin playing catchup, or ETF funds that have a wide exposure to miners and power generators such as the Market Vectors Nuclear Energy ETF, and remember stock price movements are usually leveraged to the underlying commodity. a. Slow accumulation by averaging into mega-trend positions. Investors need to learn to plan ahead to ensure one accumulates during the periodical cyclical busts, that way one buys when others are selling at market lows and sell when others are buying at market highs, unlike the way most investors operate who tend to join the booms just before it goes bust because they pay too much attention to the mainstream press, which ensure booms are euphorically reported upon and busts are overly pessimistically reported upon which means investors are usually too scared to buy when prices are cheap, and don't forget that the BlogosFear which 90% of the time just regurgitates the output of the mainstream press. So identify mega-trends and have your strategies prepared not just days in advance but YEARS, Accumulate and Buy the Panics and Sell / take profit on the Parabolic Euphoric Booms, the in between is just time. Therefore there does exist an continuing opportunity for portfolio exposure to the new nuclear mega-trend, where volatility will breed opportunity, just as the crisis of the past decade generated huge multiple opportunities to jump aboard the commodities and emerging markets mega-trends so will the opportunity to accumulate into uranium and nuclear power. In the long term all booms eventually end and where uranium is concerned that will perhaps be when nuclear fusion power becomes a reality, though not for at least 30 years, so plenty of time for today's investors to ride a uranium fission boom. Subsequent price action is not following the short-term trend expectation for a correction towards 10,700 by Mid Nov 2011. The break above 11,250 has come a lot earlier than anticipated so I am not exactly in synch with the short-term trend. The target for the bull market remains for a break above 12,000 by mid Jan 2011, the recent trend implies it could get there earlier. The stock market has broken out above 11,250 to 11,444, there has been no sell signal, the nearest of which is at Dow 11,380, so it is not at a point where any form of top can be called ahead of the first sell signal. 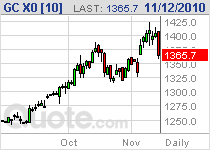 Baring this in mind, the usual tendency for a market is to reverse on the news event (Election and Fed QE2). The stock market is overbought and IS due a correction, the normal tendency for a market after a breakout is to revisit the breakout point before traveling higher which therefore to me suggests the Dow is targeting a downtrend to at least 11,200 (pending a sell signal). On a positive note, recent stock market strength implies a higher longer term target of 12,500 is possible during January 2011. Gold leaps back towards $1400 in a flash, Next ? $1450, long term $2000. Silver breakout to $26.70 continues to target $30 (Inflation Mega-trend Ebook- Silver is boxed in a very wide trading range of between $21.45 and $11, the bullish Gold outlook should push silver during 2010 towards the upper end of the range which if breached would trigger a powerful rally towards $30.). Silver investors need to keep a very close eye as its behaviour is far more volatile than gold's i.e. the current phase of the silver rally could evaporate quite quickly, especially as it nears its 2010 target of $30, don't be fooled by gold and silver bugs who are biased, SILVER IS VERY VOLATILE and could easily retrace ALL the way back to about $22, so I am eyeing to bank profits and not get blinded by the uber bullish silver sentiment that is now emerging as for instance a drop from about $29 to $22 would be a huge 33%! Remember there is no such thing as a missed move as the market is always there, and the number one aim of trading and investing is to bank profits. Great analysis. I've been enjoying & profiting, a little, for 12 months now. I only have £3000 portfolio but I'm interest in investing in China. How could I do that? I have a share dealing account at the moment with Interactive Investor. 13 Nov 10, 02:58 China ? As a long term investor what would you recommend as an exit strategy from todays bull market? How does one know when to get out? Portfolios are actively managed, you have multiple mechanisms to liqidate from targets to stops to overbought states i.e. silver - was screaming to be liquidated as mentioned above - Aimed to sell at $29 or earlier because it targets a deep retracement to as low as $22. - Ireland / Eurozone issues coming to the surface... potential USD rally as a result? - QE2 excitement wearing off? Are we still looking at 10,700-500 on the Dow? During the past few weeks stock market sentiment appears to have become overly bullish as evidenced by the the internet littered by those that were bears when the stock market was over a thousand points lower who are now bullish AFTER the stock market has put in a sizeable rally. Even more worry some are tend patterns and expectations that are resolving towards a minor correction now for a rally into the end of the year to target 12,000+, which is the trend pattern I have had in place for the Stock Market since January 2010's Inflation Mega-Trend Ebook (FREE DOWNLOAD) and (02 Feb 2010 - Stocks Stealth Bull Market Trend Forecast For 2010). 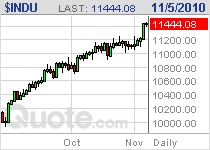 Gold managed to push to a new high all time high of $1425 before peaking out and plunging on Friday to close at $1365. Silver's strong rally continued early week by breaching $29 to peak at $29.33 before tumbling all the way to close at $26.06. Last weeks analysis specifically warned Silver investors to keep a very close eye on the market and be prepared to bank profits, as it was highly probable that all of the run up form $22 could evaporate quite quickly. With Pomo's of 8 billion running today and there runnin' them now EVERY DAY THIS WEEK.....HOW will there be a correction down to 10,500. The bond market is starting to shake and tremble. Even WSJ is publishing economist reply's to Ben B that say his policy is a destablizing joke and seen as such the world over. And a BIG F "ewww" in Bernanke's face are bond yields today climbin climbin climbin. The only way the dow falls to 10,500 in the wake of fed pomo's 3 outta 4 days thru december is IRELAND making it CLEAR they will choose a strategic default as opposed to taking the banker rescue plan (aheem) EU's irish resuce plan. Fundamentals mean squat in this market as far as correction's go.....and we have seen time and time again since this stealth bull run ...that correction's occured later and were mostly shallower than a fundamental analysis would project. An added RISK to your Dow forecast to the downside could be Bond yields headin thru the roof as international market speak to bernanke and thru political pressure and bond market distress...(accelerating property value plunge to equilibrium)all leading to pressure to ENDING..unwind/ lessen THE QE experiment. Now you think that govt's/CB's must inflate because that is the only thing they can do...esp to protect asset values....but that is true ONLY WHEN the other PRerequisite HIGHER On the banks hierachy of needs is met....KEEPING THE BOND MARKET IN LINE. And DEFLATION is oft. a good thing for creditors....of the privelaged class...so long as they remain solvent. and end to QE would cause rapidly Deflating asset prices (minus bonds) and may bring about nationalization of the banks and an exodus of wall street ceo's and talent. 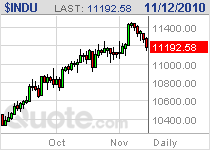 Dow is targeting 10,950 as of last update off of a sell trigger of 11,380. So 10,950 would FIRST need to be achieved before 10,700 is possible. Everyone's jumped onto the QE band wagon now. Hindsight is wonderful, isn't it ? The shallow correction is similarly clear in hindsight. The cause does not matter because its only clear in hindsight after the market has moved, today's talk of POMO's and QE is 20 months TOO LATE, a year from now the rear view mirror will point to something else being the cause for the subsequent trend. The only thing that matters is recognising trends and riding them, let academics play with the reasons in hindsight. Quick thanks for your reply / latest update. guess you were one step ahead of my question (which is a good quality to have as a market forecaster)! I know you've got a lot on your plate, but are you planning to refresh your analysis on the emerging markets sometime in the next few months? Some thoughts I've noted along those lines - Brazil crashed through your target of 66,000. Meanwhile, China's index failed before reaching that 3750 target. Which makes me wonder whether the Hang Seng is a better proxy for China than the SHSZ? "China keeps doubling its GDP all the way to overtaking the US Economy in terms of total GDP whilst at the same time wielding a bigger political stick given the political weight of its expanding dollar reserves, much as Saudi Arabia has been able to do as evidenced by everyone but those actually responsible for September 11th being blamed for the terrorist attack." You are not only a brilliant macroeconomic analyst but an astute political observer.